We are lucky to count Dr. Vitiello among our team of experienced reproductive endocrinologists. Dr. Vitiello joined the Fertility Centers of New England in 2008 from Yale-New Haven Hospital, where she was on the faculty of Yale University’s Department of Obstetrics and Gynecology. Dr. Vitiello graduated with honors in chemistry from Boston University. She received her medical degree from the University of Vermont where she also received a Ph.D. in Molecular Genetics. She completed her internship and residency at Yale-New Haven Hospital and continued at Yale to complete her fellowship in reproductive endocrinology and infertility. Dr. Vitiello is a member of the Alpha Omega Alpha Honor Society and numerous other academic and medical societies, including the American Society for Reproductive Medicine. She is included in the Best Doctors in America 2014 database. Being named a Best Doctor is an honor recognizing only the top five percent of U.S. doctors. 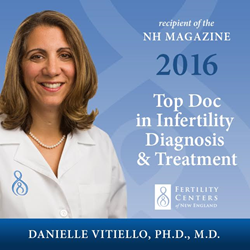 Dr. Vitiello continues to see patients in the Fertility Centers of New England New Hampshire offices in Bedford and Nashua, as well as, the Reading, MA office. The Fertility Centers of New England is an international leader in the evaluation, diagnosis, and treatment of infertility. We combine advanced reproductive technologies with a comforting, supportive environment to give patients the personal care they deserve. The Fertility Centers of New England has ten convenient locations for treatment and cycle monitoring throughout New England. We accept all insurance plans and offer a range of options for self-pay patients, including donor oocyte cycles. Patients interested in obtaining additional information about the Fertility Centers of New England may call our center at 877-877-9901 or visit us at http://www.bostonfertilitycenter.com/.